What do you do now and what are you planning for the future? 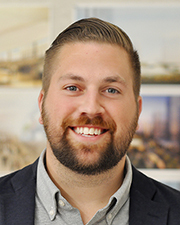 I am an Urban designer/planner at FXCollaborative where I help guide many large-scale, multi-generational master plans in the Northeast, specifically in New York City and Philadelphia. I am also passionate about furthering social and racial equity through design. I do this work through writing, speaking and teaching to students and other professionals in the design and real estate industry. How do you unwind from a busy day? Walks through my Lefferts Gardens neighborhood with my wife and our two year old puppy. Rules to live by in business: Don’t base your performance off the performance of others. What is your dream job? I’m a drummer, so I’d say a professional musician.